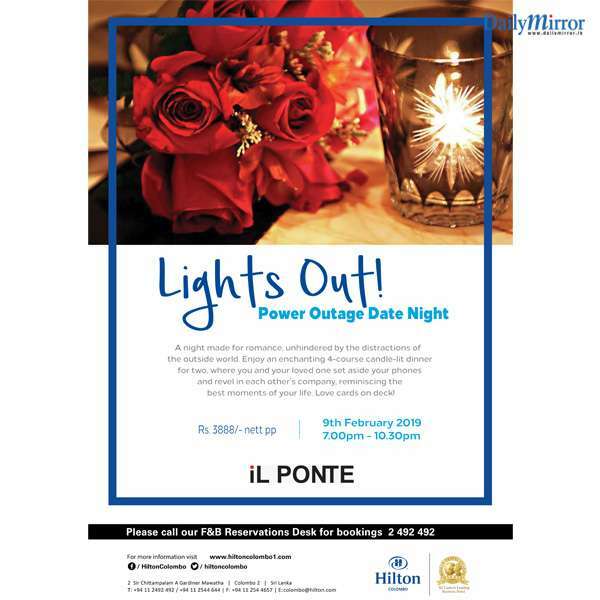 Daily Mirror - Power Outage Date Night At Hilton Colombo! A night made for romance at the Il Ponte , Hilton Colombo on Saturday 9th February. Unhindered by the distractions of the outside world, enjoy an enchanting 4-course candle-lit dinner for two at Rs 3888 nett per person, where you and your loved one set aside your phones and revel in each other’s company, reminiscing the best moments of your life. Love cards on deck! 7pm – 10.30pm.